Gayl Jones’s first novel, Corregidora, won her recognition as a writer whose work was gripping, subtle, and sure. It was praised, along with her second novel, Eva’s Man, by writers and critics from all over the nation: John Updike, Maya Angelou, John Edgar Wideman, and James Baldwin, to name a few. The publication of The Healing, her first novel in over twenty years, is a literary event. The Healing is a lyrical voyage backward through Harlan Jane Eagleton's life as a beautician, a photo journalist, a rock star manager, and a traveling faith healer. The Healing "examines precisely what its title announces: healing from silence, from physical attacks and treachery, from spiritual and cultural isolation, from the pain of old-fashioned, aching, bluesy love. . . . The Healing depends on fr ee association, a gradual building of connections and insights that culminates in a giddy outpouring of language." "What's it they usedta call women like you? A adventuress? A color-girl adventuress," Joan says of Harlan (p. 232). What sort of woman is Joan? Is she similar or dissimilar to Harlan? What qualities do Joan and Harlan share throughout their separa te and collaborated adventures? At times, Harlan sounds prophetic: "Seem like most people turn they own flaws of character into virtues. They see other people's flaws, but they own flaws, they turn into virtues" (p. 46). Do you agree with Harlan's insight? Does Jones use the narr ator as an avenue for her own"preaching"? Harlan heals people without the use of modern western medicine. Her practice has an audience of stout believers and stanch skeptics. Are readers meant to believe in Harlan's "powers"? Do you? Consider the unicorn story (p. 136) and the turtle woman story (pp. 135, 164, 221, 281). What do these stories say about appearances and reality? About personal healing and transformation? How do they relate to Harlan? How do they relate to you? "Whenever you're about to do something mean or disrespectful to someone imagine they're Christ, she'd say, and then decide how to treat them. . . . So, among some, she got the reputation for being a good and wise woman. Among others, she was consider ed a fool and a pushover" (p. 129). What is your position on Harlan"s mother's philosophy? Do you find the narrator's exploration of abstract ideas distracting or enhancing to the flow of the story? Why do you think it's such a large part of the book? Carolina, the Italian woman, says,"All women all over the world are just pawns in a man's game" (p. 237). Norvelle says that men and women are natural enemies (p. 258). Do you agree/disagree with either of the claims? Did you find yourself reacting strongly toward any comments on gender? Jones explains the origins of Maine's black population (p. 183). Were you aware of this before reading The Healing? Can you find other passages in which Jones challenges your beliefs about race? Jones gives us an extensive reading list on page 247. Why? What information does she want us to take from these titles? In the 23 November 1998 issue of The Nation, Tom LeClair writes,"We hear a lot more about books than music in the novel. Maybe Big Music stands for Big Publishing. And is it 'healing' or 'heeling,' or both? Does the novelist heel to lowest-common-denominator expectations 'to accessible sentimentality' in order to disquiet from within?" How would you respond to the quest ions LeClair raises? Joan says, "But I knew the true reason, that he [James] didn't want me to be a singer anyway" (p. 192). Why? What are Joan"s feelings toward James? Jones chooses not to put quotation marks around the speech of her characters in The Healing. What effect, if any, does this have on the story, told in first-person narration? How would the story have been different with a third person narrat or and traditional punctuation? Frequently found throughout The Healing are passages full of repetition: "That's what you mean, said Joan. That's what you mean. That's what you mean. I thought you meant that" (p. 243). How do you react to the amount of repetition in the narration? How does the repetition serve Jones"s intent? Consider Jones's title. In what senses does a healing occur? Can you name everyone who is healed? What does it mean to be healed in each case? 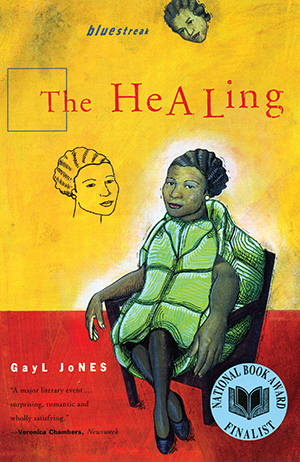 Gayl Jones became a National Book Award finalist for . In your opinion, what makes this book stand out from others? Writing exercise: The Healing reveals Harlan's first faith healing early on, then recounts the events that led to it. In reverse chronological order, try writing a paragraph on an experience of your own, keeping suspense throughout the parag raph. Consider what the following reviewers have written about The Healing. Do you agree? What would your review have said? "In this novel brimming with ideas, the most constant is the notion of a woman's absolute need to determine for herself who she is." "Jones has taken on many conventions of oral storytelling—a repetition of phrases, a relaxed flow of comment, interruption, and ongoing action—to good effect. With this wily, witty testimony of good and bad faith, Jones triumphantly reenters th e fray." "Moving back and forth in time, Jones weaves a tale that rewards the reader with a euphoric conclusion. . . . The writing is masterful: repetitions in sentences, abrupt changes in the linear narrative, and the use at times of an earthy argot, all create tension and suspense while simultaneously propelling the story." "The remarkable thing about Harlan, and about The Healing from the opening chapter, is the way in which her insatiable curiosity and trenchant observations sweep the narrative along—though backward, from Harlan's faith healer present to her pa st. Each time shift moves Harlan ever closer to the source of her true calling." "One of the most distinguished African American women of letters, Jones, who is also a playwright, poet, and short story writer, offers her first novel to be published in the U.S. in 20 years. It is gripping, beautiful, and well worth the wait." Gayl Jones was born in Kentucky in 1949; she attended Connecticut College and Brown University; she has taught at Wellesley and the University of Michigan. The Healing is her first novel published in twenty years—and with it she became a fina list for the National Book Award. Her preceding awards include a Mademoiselle Award, a National Endowment for the Arts Grant, and a Schubert Foundation Grant for Playwriting. Her other books include the novels Corregidora, Eva's Man, and < I>Mosquito; a story collection, White Rat; the book-length poem Song for Anninho; and a nonfiction work, Liberating Voices: Oral Tradition in African American Literature. Jones has reading knowledge of six languages and has been learning Japanese and Indonesian.